Not too long ago, Riftstalker required keeping up 3 different buffs (two on 30-sec timer), rotating blinks for threat, and managing cooldowns. It was a fast, engaging playstyle. There were certainly problems with it -- until your buffs were up, you'd get one-shot. There were tricks to get CP as fast as possible to help, but they didn't work well. So something had to change, and we had Rift Guard merged into Guarded Steel and blinks. And you could throw up Guarded Steel regardless of CP with no penalty. This was an unfortunate direction for the playstyle to go, but it was done for good reasons so I think most people accepted it. In 1.8 we've had yet another finisher removed and the mitigation made passive. I don't see why it has to be passive this time. If anything, I'd like more buffs to rotate to get back to the original playstyle. RS is now down to a single relevant finisher -- so there's nothing to really manage. The playstyle is just blinks and cooldowns. If these changes go live, I'll still keep up Annihilate and use Deadly Strike when I can just to keep myself engaged. But I'd much rather have it actually matter to my tanking ability. Please make the 1.8 mitigation an active 30-sec finisher buff that scales with CP. We already get 10% mit from RS crystal on pulling mobs. This gives us enough time to get up Guarded Steel & 5CP/finisher for mit. Last edited by Beckmann; 02-21-2012 at 09:17 AM. Post title typo fail. FML. I don't like the FB change either, but if you really are looking to min/max your effectiveness, you can still micromanage finishers. FB will still exist, just in a less useful form for tanking. I'm going to have to disagree with you here on making more of our mitigation a finisher. It was a good design decision to make out mitigation easier to get up and running so we don't get destroyed on fights with immediate heavy damage. False blade was fine and fun because it was avoidance, which you can't count on anyhow but is nice for reducing the overall damage you take over the long run. I think if we have another useful finisher for tanking it should NOT be mitigation but avoidance or some other kind of utility. The heal isn't a totally bad idea except for the fact that the amount and heal rate is terrible. It shouldn't last more than 5 secs if it's a HoT (so you can do it twice in a row) and the amount should be based at least somewhat on maxHP so it actually scales with tank gear but is still useful in DPS specs. The best tanking builds will not have FB, so no it's not available to manage. "another button to press" could describe anything in this game. The playstyle is the sum of everything that goes into playing the role. Rotating finishers used to be part of that. In 1.8, it won't be, and I don't want to see that happen. And to be clear, I don't miss the Splinter Shot trick except for how it rewarded you for learning your class. As I said, it didn't work that well, and changes were needed. Good point on FB, we won't be going 8 BD anymore. But isn't that indicative of a change to tank-soul synergy that is really uncalled for? In any case the only way they could kill RS playstyle for me is to remove the shifts and replace them with ranged abilities - being an uber-mobile tank to me is just so much cooler than any tanking class I've played in any other game. Last edited by Avadiator; 02-26-2012 at 07:09 AM. If you were a serious tanker you had a sab spec with silent setup. 5 Charges -> 5 CPs, switch to RS and instant 5 CP Rift Guard at start of fight. It still works if you want to min/max, on say Sicaron. Get 5 CPs -> Instant Annihilate at beginning for BS. Or you can get annihilate up in a duel and then start with a 5 CP Impale. Having to use finishers to handle our mitigation is not exciting, engrossing or good design. Its a play style tax and makes us less effective at tanking. Our tankyness should stem naturally from our spec and cooldowns we choose to use. Our finishers should give us strategic options in combat that we weigh and use based off the situation. The fact is we just go through our mind numbing rotations to keep our buffs on us while slamming our spam macro key. 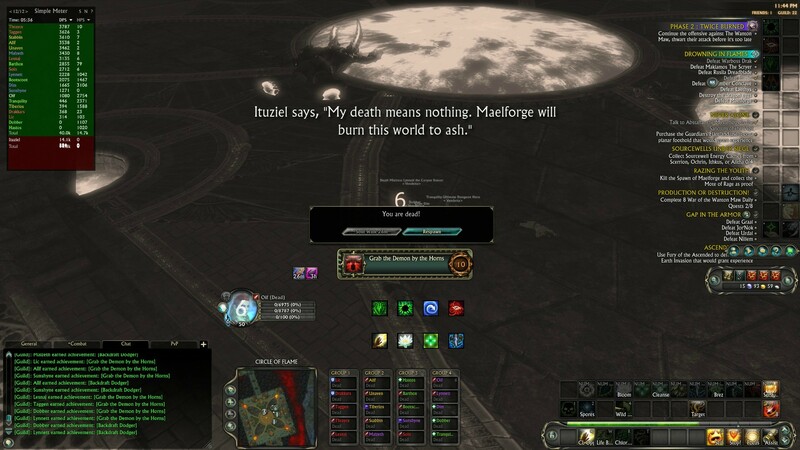 The fact there used to be more finishers to manage in here did not make riftstalking any more interesting or require more skill, it just made it worse than other forms of tanking. To repeat, our finishers need to give us meaningful strategic choices that we opt to use in a fight, instead of "keep up steel & false blade dummy! what else would you do". But thats my opinion. Removing FB from your rotation is not removing a finisher from Riftstalker. It's removing a finisher from an inferior T2 runner spec. Also the best T1 raid tanking spec period. tbh, I tank T1 raids and HK trash with 11k HP as 44RS/5Sab/17BD. Last edited by Koe; 02-26-2012 at 08:54 AM. 90 - 5 = 60 ????? And you don't see the problem with "90% avoidance" (which probably isn't even possible)? I feel like the suggestion that losing 5% dodge and gaining 5% mitigation will make this spec not function is senseless hyperbole. Maybe a little less effective, but I'm guessing your avoidance will still be more than enough to keep TTT up in those situations. Mitigation is a non-factor, for the most part, for trash and adds. T1 raids, it's only an issue if you're currently progressing in them from start. Even then, it's only magical mitigation that woule be lacking sicne your deflect would be through the roof(I'll admit, tanking Herald/GS with breaths hitting for 2-4k each tick with only 11k HP is kind of risky, but I/we still do it.) It's not just about keeping TTT up, it's about doing more DPS(aka Strikeback). I'm not sure why you wouldn't want to still go 17 points into BD for TtT after 1.8. Damage redux by 10% is still amazing. The build I am looking at right now is 44RS/17BD/5Sab. I am mostly all HK gear minus a ranges weap and self buffed I am @ 29% dodge and 53% deflect w/ guarded steel up. You stack TtT, Phantom Blow, and Rift Guard on top of that and I don't see any complaints about mitigation. The one complaint if any would be that my hp are around 16k self buffed in this build but in a raid setting i will still have plenty. In the same gear but this time 51RS/8Rng/7Bard. I'm at 18.4k hp self buffed but only 19% dodge and 45% deflect w/ guarded steel up. For me, I will take the increase mitigation over hp.